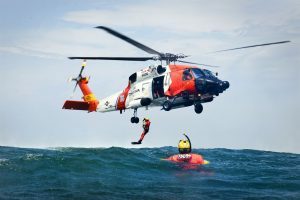 U. S. Coast Guard Lt. Tyler Dewechter praised the crew for their quick action and thorough training. 58-year-old Terry Britton, 43-year-old Patrick Leoni, and 29-year-old Kyle Haskins were floating in the life raft for approximately two hours before their rescue. No injuries were reported. April 6th is National 406 Day. This news report reminds us all just how important it is to keep EPIRB registration current.